Click here to read up on what the Center for Disease Control and Prevention (CDC) has reported about the H1N1 Flu. Hemophagocytic lymphohistiocytosis (HLH) is a rare disorder of the immune system primarily affecting young infants and children. Although physicians have written about the disorder over the years, it has been only in the last few years that it has received more widespread attention. The prevalence of HLH is 1.2 in every 1,000,000 children under the age of 15. In 1985, physicians from all over the world who were interested in studying the histiocyte and disorders related to this cell created the Histiocyte Society. Thanks to their research, in part financed by the Histiocytosis Association of America (HAA) and national subgroups, we now have a better understanding of the disease, as well as dramatically improved treatments. With growing knowledge, there is also increased awareness of the disease among nonspecialized physicians. The disease usually presents with fever and sometimes other symptoms of an infection. In many cases, a pathogen (viral, bacterial, etc.) can be identified. The human body contains many cells including T-cells and histiocytes that fight infection. The activation of these cells causes an inflammatory reaction in the body. Normally, when the pathogen has been eliminated, the inflammatory reaction is turned off, and the immune system returns to its steady state. In HLH patients, due to defect of the immune system, the inflammatory reaction persists and causes the symptoms of HLH. What is the cause of this severe immune dysregulation? We currently know that HLH occurs either on the basis of a genetic defect or as a secondary form with underlying diseases such as infections, cancer, or rheumatic diseases. In the primary form, also known as familial hemophagocytic lymphohistiocytosis (FHL or FHLH), defective genes are inherited from both the mother and the father (autosomal recessive inheritance). FHL is diagnosed if there is more than one affected child in the family and/or a gene defect has been determined. FHL should be suspected if the symptoms do not disappear with treatment or if symptoms recur when therapy has been stopped. The onset of FHL is usually early in life, and a persistent cure can only be achieved with BMT (bone marrow transplantation). It is important to know that infections can trigger both the familial and the secondary disease. So far, 3 gene defects have been identified, which account for approximately 50% to 80% of the familial cases, depending on the population that has been analyzed. Two of the genes, PRF1 and UNC13D, are responsible for the synthesis of proteins, perforin, and MUNC13-4 that are involved in the killing process of infectious pathogens. They are believed to also have a function in switching off immune responses. The precise mechanism, however, is not fully understood. A third defect affecting the Syntaxin 11 (STX11) gene has so far only been detected in patients of Turkish origin. The function of the mutated protein remains to be elucidated. There remains a considerable percentage of FHL patients with no known underlying gene defect. In cases of secondary HLH, a condition of temporary immunodeficiency seems to contribute to the development of the disease. Typical symptoms of HLH besides persistent fever are pallor (paleness), jaundice, liver and spleen enlargement, and neurological symptoms, such as irritability or even seizures. The involvement of the bone marrow, the site of blood cell production, can lead to severe decline of the blood cell counts (red and white blood cells and platelets). On bone marrow examination, histiocytes that are “eating” other blood cells (also known as phagocytosis) can be detected. Although the disease was named after this phenomenon, it can be absent at the onset or even throughout the course of the disease. Because symptoms can vary widely, it is sometimes difficult for the physician to make a diagnosis of HLH early in the course of the disease without the help of specialized laboratory tests. To facilitate a rapid and accurate diagnosis, the Histiocyte Society has created diagnostic guidelines and recommendations concerning the treatment of HLH. This is known as the HLH-2004 treatment protocol. It is sometimes difficult to establish the diagnosis of HLH, and the combination of the clinical picture and certain laboratory test criteria is required. A test that has been found very useful in substantiating a clinical diagnosis of HLH is absent or low NK (natural killer)-cell function. This is found in 90% of patients with FHL, as well as in many cases of secondary disease. Results of NK-cell function testing are generally reliable if the blood sample is properly shipped and tested in less than 24 hours. NK function cannot be determined prenatally, and it may not be reliably studied until a child is several weeks old. Notably, this test does not discriminate between familial and secondary disease. Detection of perforin by staining of lymphocytes and analysis by flow cytometry is a highly reliable method for predicting the likelihood of the PRF1 gene mutation as the cause of FHL in a given patient. This test can also be used with reasonable predictive potential to screen parents and siblings to determine whether they might be carriers of PRF1 mutations. This test is not available prenatally. Another test recently described analyzes the expression of a molecule on the surface of NK-cells (CD107) by flow cytometry that marks NK-cell degranulation. Reduced expression can predict mutations in the UNC13D gene. This test also requires specially prepared blood samples and cannot be used prenatally. Genetic testing is recommended in cases of suspected FHL and confirms the diagnosis. Usually a blood sample is used. Even in the event of death, salvaged tissue can be tested. Once the genetic defect of a patient is known, the parents and siblings can be easily tested to determine if they are carriers for this specific defect. In such cases, prenatal diagnosis is possible as well. Without treatment, FHL is usually rapidly fatal with a median survival of about 2 months. The current treatment protocol, HLH 2004, provides recommendations for HLH therapy with a combination of immunosuppressive drugs and chemotherapy. The protocol has been accepted internationally and is used in many countries worldwide. In order to prevent early death or severe persisting organ damage, therapy must be initiated in a timely manner. In FHL cases, only temporary remission will be achieved. For a definite cure, the patient must undergo BMT. With the former HLH-94 protocol and the now active HLH-2004 protocol, high remission rates and cure rates with BMT have been reported. Secondary HLH sometimes resolves spontaneously or after treatment of the underlying disease. In some cases, modified immunochemotherapy can be applied, while in others, full immunochemotherapy is required. As I was packing up my scrapbooking room today - I came across a book that I had to read during my senior year of nursing school. In this book is a paragraph that I quoted in my presidential speech at graduation. But in reading it today, it once again reminded me of the main reason that chose nursing as a career - to care for others. You can read the rest of my speech here, but below is the paragraph I am referring to. I comes from the book Sacred Work by Erie Chapman. Treacher Collins syndrome is a condition that affects the development of bones and other tissues in the face. The signs and symptoms of this disorder vary greatly, ranging from almost unnoticeable to severe. Most affected individuals have underdeveloped facial bones, particularly the cheek bones, and a very small jaw and chin (micrognathia). Some people with this condition are also born with an opening in the roof of the mouth called a cleft palate. 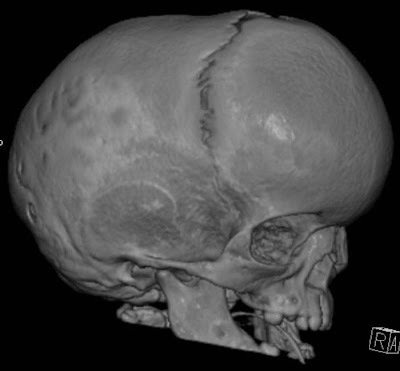 In severe cases, underdevelopment of the facial bones may restrict an affected infant's airway, causing potentially life-threatening respiratory problems. People with Treacher Collins syndrome often have eyes that slant downward, sparse eyelashes, and a notch in the lower eyelids called a coloboma. Some affected individuals have additional eye abnormalities that can lead to vision loss. This condition is also characterized by absent, small, or unusually formed ears. Defects in the middle ear (which contains three small bones that transmit sound) cause hearing loss in about half of cases. People with Treacher Collins syndrome usually have normal intelligence. Mutations in the TCOF1 gene cause Treacher Collins syndrome. The TCOF1 gene provides instructions for making a protein called treacle. Although researchers have not determined the precise function of this protein, they believe that it plays a critical role before birth in the development of bones and other tissues in the face. Mutations in the TCOF1 gene reduce the amount of treacle that is produced in cells. Researchers believe that a loss of this protein signals cells that are important for the development of facial bones to self-destruct (undergo apoptosis). This abnormal cell death may lead to the specific problems with facial development found in Treacher Collins syndrome. Read more about the TCOF1 gene. This condition has an autosomal dominant pattern of inheritance, which means one copy of the altered gene in each cell is sufficient to cause the disorder. About 60 percent of cases result from new mutations in the TCOF1 gene. These cases occur in people with no history of the disorder in their family. In the remaining cases, a person with Treacher Collins syndrome inherits the altered gene from an affected parent. Where can I find information about treatment for Treacher Collins syndrome? These resources address the management of Treacher Collins syndrome and may include treatment providers. You might also find information on treatment of Treacher Collins syndrome in Educational resources and Patient support. Where can I find additional information about Treacher Collins syndrome? You may find the following resources about Treacher Collins syndrome helpful. These materials are written for the general public. The resources on this site should not be used as a substitute for professional medical care or advice. Users seeking information about a personal genetic disease, syndrome, or condition should consult with a qualified healthcare professional. Supraventricular (originating above the ventricles) tachycardia (SVT) is a series of fast atrial heartbeats that can cause the heart to contract at rates of 250 times per minute or faster. SVT can be uncomfortable and frightening. The type of treatment depends on whether the electrical impulses reenter the atria via a bypass tract (Wolff-Parkinson-White syndrome), through the atrioventricular (AV) node, or are caused by a single abnormal group of cells. Wolff-Parkinson-White Syndrome is a common cause of SVT. In WPW there is an abnormal electrical connection between the atria and ventricles. This extra tissue is a short circuit between these chambers. It provides an extra pathway for electrical impulses to be conducted through the tissue that normally blocks electrical impulses between the atria and ventricles. This short circuit is called an accessory pathway, and it allows electrical impulses to travel between the atria and the ventricles without going through the AV node. In WPW, an SVT is usually started when an impulse travels down the AV node to the ventricles and then up through the short circuit tissue to the atria. This impulse can then travel through the atria and down the AV node before the SA node can start the next heartbeat. If the impulse continues to travel in this repeating, circular pattern, it can cause the heart to beat very rapidly. AV Nodal Reentrant Tachycardia (AVNRT) is another common form of SVT. In AVNRT, there is an extra electrical pathway in or near the AV node. If an electrical impulse is conducted in this pathway, it may direct the impulse through both the AV node and the extra pathway in a repeating, circular pattern. The AV node and the extra pathway are located essentially in the center of the heart. This causes the upper and lower chambers to beat rapidly at the same time instead of in the normal sequence (upper chambers beating first, followed by the lower chambers). In some SVTs the atria may spontaneously generate multiple rapid impulses. Many of these impulses can travel through the AV node to the ventricles in an erratic manner. As a result, the heart rhythm can become irregular and rapid. If this happens, the heart will not pump blood efficiently. Atrial flutter is one of the more common SVTs, where the upper chambers of the heart (atria) beat anywhere from 240 to 320 times per minute. This arrhythmia is similar to atrial fibrillation, as it originates entirely within the upper chambers, but it produces a more organized, regular rhythm. It is usually not harmful, but can result in symptoms such as palpitations, shortness of breath, chest tightness, fatigue, and lightheadedness. If left untreated, atrial flutter may eventually lead to conditions associated with other arrhythmias that result in abnormally high heart rates. Even though the upper chambers are beating rapidly, the AV node allows only one-half to one-third of the electrical impulses to reach the hearts lower chambers (the ventricles). This prevents the arrhythmia from becoming life-threatening, and keeps the wrist pulse rate at only 100 to 150 beats per minute. This arrhythmia can last for hours or days; therefore, most people with atrial flutter require treatment. Every normal heart has a normal rhythm. That rhythm varies from person to person. In most healthy people, the heart at rest beats about 60 to 100 times per minute. A small bunch of heart cells called the sinoatrial node keeps time. © 2008 St. Jude Medical, Inc. The appendix is a closed-ended, narrow tube up to several inches in length that attaches to the cecum (the first part of the colon) like a worm. (The anatomical name for the appendix, vermiform appendix, means worm-like appendage.) The inner lining of the appendix produces a small amount of mucus that flows through the open center of the appendix and into the cecum. The wall of the appendix contains lymphatic tissue that is part of the immune system for making antibodies. Like the rest of the colon, the wall of the appendix also contains a layer of muscle, but the muscle is poorly developed. What is appendicitis and what causes appendicitis? The white blood cell count in the blood usually becomes elevated with infection. In early appendicitis, before infection sets in, it can be normal, but most often there is at least a mild elevation even early. Unfortunately, appendicitis is not the only condition that causes elevated white blood cell counts. Almost any infection or inflammation can cause this count to be abnormally high. Therefore, an elevated white blood cell count alone cannot be used as a sign of appendicitis. Urinalysis is a microscopic examination of the urine that detects red blood cells, white blood cells and bacteria in the urine. Urinalysis usually is abnormal when there is inflammation or stones in the kidneys or bladder. The urinalysis also may be abnormal with appendicitis because the appendix lies near the ureter and bladder. If the inflammation of appendicitis is great enough, it can spread to the ureter and bladder leading to an abnormal urinalysis. Most patients with appendicitis, however, have a normal urinalysis. Therefore, a normal urinalysis suggests appendicitis more than a urinary tract problem. Abdominal X-Ray An abdominal x-ray may detect the fecalith (the hardened and calcified, pea-sized piece of stool that blocks the appendiceal opening) that may be the cause of appendicitis. This is especially true in children. An ultrasound is a painless procedure that uses sound waves to identify organs within the body. Ultrasound can identify an enlarged appendix or an abscess. Nevertheless, during appendicitis, the appendix can be seen in only 50% of patients. Therefore, not seeing the appendix during an ultrasound does not exclude appendicitis. Ultrasound also is helpful in women because it can exclude the presence of conditions involving the ovaries, fallopian tubes and uterus that can mimic appendicitis. Computerized tomography (CT) Scan In patients who are not pregnant, a CT Scan of the area of the appendix is useful in diagnosing appendicitis and peri-appendiceal abscesses as well as in excluding other diseases inside the abdomen and pelvis that can mimic appendicitis. Laparoscopy Laparoscopy is a surgical procedure in which a small fiberoptic tube with a camera is inserted into the abdomen through a small puncture made on the abdominal wall. Laparoscopy allows a direct view of the appendix as well as other abdominal and pelvic organs. If appendicitis is found, the inflamed appendix can be removed with the laparascope. The disadvantage of laparoscopy compared to ultrasound and CT is that it requires a general anesthetic. There is no one test that will diagnose appendicitis with certainty. Therefore, the approach to suspected appendicitis may include a period of observation, tests as previously discussed, or surgery. It can be difficult to diagnose appendicitis. The position of the appendix in the abdomen may vary. Most of the time the appendix is in the right lower abdomen, but the appendix, like other parts of the intestine, has a mesentery. This mesentery is a sheet-like membrane that attaches the appendix to other structures within the abdomen. If the mesentery is large, it allows the appendix to move around. In addition, the appendix may be longer than normal. The combination of a large mesentery and a long appendix allows the appendix to dip down into the pelvis (among the pelvic organs in women). It also may allow the appendix to move behind the colon (called a retro-colic appendix). In either case, inflammation of the appendix may act more like the inflammation of other organs, for example, a woman's pelvic organs. The surgeon faced with a patient suspected of having appendicitis always must consider and look for other conditions that can mimic appendicitis. Among the conditions that mimic appendicitis are: Meckel's diverticulitis. A Meckel's diverticulum is a small outpouching of the small intestine which usually is located in the right lower abdomen near the appendix. 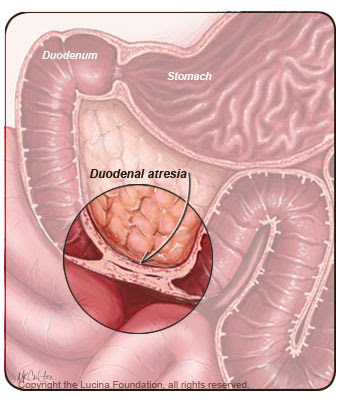 The diverticulum may become inflamed or even perforate (break open or rupture). If inflamed and/or perforated, it usually is removed surgically. Pelvic inflammatory disease. The right fallopian tube and ovary lie near the appendix. Sexually active women may contract infectious diseases that involve the tube and ovary. Usually, antibiotic therapy is sufficient treatment, and surgical removal of the tube and ovary are not necessary. Inflammatory diseases of the right upper abdomen. Fluids from the right upper abdomen may drain into the lower abdomen where they stimulate inflammation and mimic appendicitis. Such fluids may come from a perforated duodenal ulcer, gallbladder disease, or inflammatory diseases of the liver, e.g., a liver abscess. Right-sided diverticulitis. Although most diverticuli are located on the left side of the colon, they occasionally occur on the right side. When a right-sided diverticulum ruptures it can provoke inflammation they mimics appendicitis. How is appendicitis treated? Once a diagnosis of appendicitis is made, an appendectomy usually is performed. Antibiotics almost always are begun prior to surgery and as soon as appendicitis is suspected. How is an appendectomy done? The most common complication of appendectomy is infection of the wound, that is, of the surgical incision. Such infections vary in severity from mild, with only redness and perhaps some tenderness over the incision, to moderate, requiring only antibiotics, to severe, requiring antibiotics and surgical treatment. Occasionally, the inflammation and infection of appendicitis are so severe that the surgeon will not close the incision at the end of the surgery because of concern that the wound is already infected. Instead, the surgical closing is postponed for several days to allow the infection to subside with antibiotic therapy and make it less likely for infection to occur within the incision. Wound infections are less common with laparoscopic surgery. Another complication of appendectomy is an abscess, a collection of pus in the area of the appendix. Although abscesses can be drained of their pus surgically, there are also non-surgical techniques, as previously discussed. Recently it has been hypothesized that some episodes of appendicitis-like symptoms, especially recurrent symptoms, may be due to an increased sensitivity of the intestine and appendix from a prior episode of inflammation. That is, the recurrent symptoms are not due to recurrent episodes of inflammation. Rather, prior inflammation has made the nerves of the intestines and appendix or the central nervous system that innervate them more sensitive to normal stimuli, that is, with stimuli other than inflammation. This will be a difficult, if not impossible, hypothesis to confirm. The appendix is a small, worm-like appendage attached to the colon. 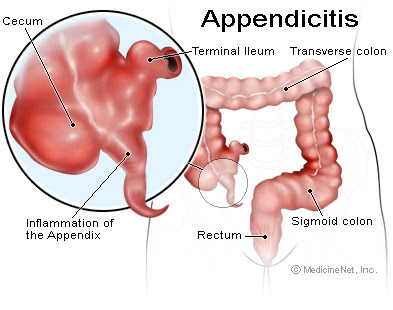 Appendicitis occurs when bacteria invade and infect the wall of the appendix. The most common complications of appendicitis are abscess and peritonitis. The most common manifestations of appendicitis are pain, fever, and abdominal tenderness. Appendicitis usually is suspected on the basis of a patient's history and physical examination; however, a white blood cell count, urinalysis, abdominal x-ray, barium enema, ultrasonography, CT, and laparoscopy also may be helpful in diagnosis. Due to the varying size and location of the appendix and the proximity of other organs to the appendix, it may be difficult to differentiate appendicitis from other abdominal and pelvic diseases.